Silver and gold, silver and gold... Silver VS Gold? That's what is on the line right now for this holiday season. Are you a silver stunner or a golden goddess? We'll let you decided which is best for you, but regardless these palettes will give you the perfect red lip for any outfit, with some beautiful metallic shimmers sure to stun. Designed for the masses, this color theory lip palette helps anyone find their perfect red. Coloristas bickered with one another. Silver or gold was the source of the tension. So silver or gold friends? This palette was designed for everyone. Here is how to use it for your own tones. 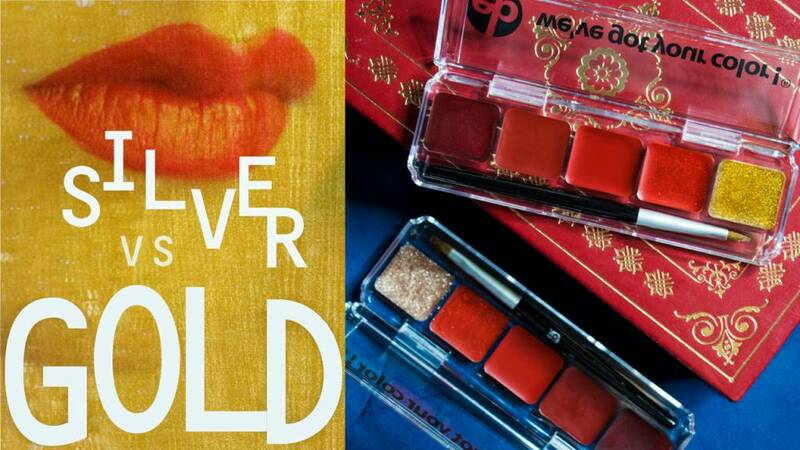 If you wear cooler lip colors such as blue or red undertones (aka Summer/Winter) the first category is for you. If you wear warm lip colors such as yellow or orange undertones (aka Spring/Autumn) the second section if for you. Poisonsettia is a deep sultry red with a hint of purple that is perfect for the cooler toned red clothing that is all the rage this season. You can choose to warm him up with any of the other colors for an interesting ombre or tone to perfectly match that red of yours. Secret Santa is a gorgeous statement red that is ideal for cool toned folks. Apple of Eye will need to be cooled down a bit. Try adding Poisonsettia or if you just need a little coolness Secret Santa or Ms Claus. Good Girl or Belle Bell could go over any of the colors, so you'll need to decide for yourself where you feel best. Though for cool gals Belle Bell could actually go over Apple of Eye by itself, whereas Good Girl would have to be combined with another color. Bonus points for using Icy as an eye pop with this stunning palette. You could also combine Icy and Rose Silver for a amazing look that will bring the perfect balance of a youthful flush to those eyes. For a warmer look that will coordinate with Good Girl amazingly use Gold Flecks as the cool girls cheat sheet for a gold glow. Poisonsettia is a deep sultry red with a hint of purple that will need to be warmed up with either Apple of Eye or Good Girl. Wear Secret Santa with Good Girl or if you aren't the warmest then Ms Claus is a stunning gloss. Good Girl or Belle Bell could go over any of the colors, so you'll need to decide for yourself where you feel best. 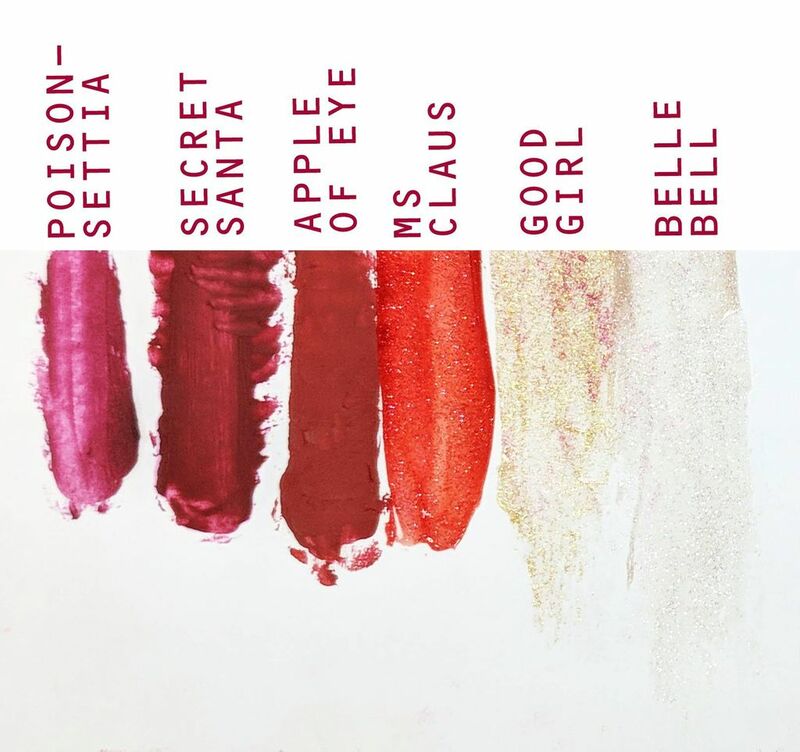 Though for warm gals Good Girl is definitely going to be your favorite go-to gloss that is perfect for any of the lips and will do marvels for those cooler toned lipsticks Poisonsettia and Secret Santa. Silver tends to be a blah color for warm folks, so I'd highly recommend going with the gold gloss palette. Bonus points for using Reflective or Rose Gold as an amazing eye shadow that will enhance your youthful flush. Perky is also a nice touch for a subtle warm flush.